Rev. Samuel Parker : Canoe at Columbia River, 1835. Published by the Author, Ithaca, New York, 1838, pages 149 -150, page 348. Rev. 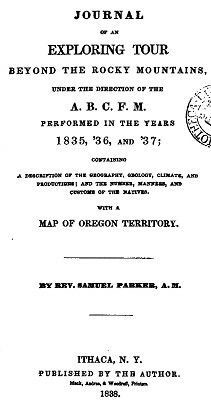 Samuel Parker's (1779-1866) short account of crossing the river bar at the mouth of the Columbia River in a native canoe simply illustrates that the technique of riding to shore on the wave face was the standard and safest method adopted by native fisherman with an intimate knowledge of these conditions. The are some general descriptions of Honolulu and Waikiki. Mouth of the Columbia River, 1835. The morning of the 27th (October) was pleasant and inviting for a water excursion; but on account of sudden changes of weather which are common at this season of the year, I did not think it best to cross the wide bay, but took four Chenook Indians and a half breed, named Thos. Pish Kiplin who could speak English, and went in a large canoe down to Clatsop and Point Adams, nine miles from the fort. There was a gentle wind from the east, which favored hoisting a small sail. By this time the waves had so increased and the white caps were so numerous that to one not acquainted with nautical adventures, the danger in a canoe appeared great. We could do nothing, except to run before the wind, and when we were upon the top of one wave, it seemed the next plunge would swallow us up. Fears were of no use in this situation, and I therefore kept up such conversation as was calculated to suppress any which might arise in the minds of the men. It was interesting to see how the Indians would take the waves with their paddles so as to favor the safety of the canoe. But our rapid progress soon brought us to the shore near Point Adams. Here a new difficulty, and unexpected to me, arose, which was, how should we land in the high surf; but my skilful mariners watched an opportunity to shoot the canoe forward as far as possible on a flowing wave, and as soon as it broke, they leaped into the water and seized the canoe and lightened it over the returning surge, and drew it up beyond the reach of the waves. This management was an ocular demonstration of the skill of Indians on dangerous seas. On the morning of the 14th of July, land was announced. The islands of Ranai and Morakai were near, and as we passed them, we had a near view of the latter. It is not so mountainous as most of the others of the group, and presented rather a sterile aspect. We soon after made Oahu, and passed on the east side around to the harbor of Honolulu on the south. This harbor is the best and almost the only good one in any of the groups of the Polynesian islands. The entrance is somewhat intricate, and requires an experienced pilot to take ships in safely. without the reefs which affords good anchorage, renders the port desirable, and the island, in a commercial point of view, the most important of any in this part of the Pacific ocean. Four miles south-east of Honolulu is the pleasant native village of Waititi, situated on the bay of the same name. It contains five or six hundred inhabitants, is situated in a beautiful grove of cocoanut trees, which adds very much to its appearence and comfort. This place, if the cultivation was proportioned to the richness of the soil, might be made one of the most delightful spots on the island. Published by the Author, Ithaca, New York, 1838. Geoff Cater (2010-2012) : Rev. Samuel Parker : Canoe at Columbia River, 1835.